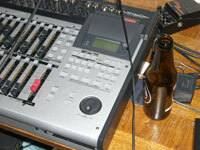 The Fullrotor songs were recorded on assorted analog and digital equipment through various cheap mics. Casios were involved occasionally, as was an out-of-tune piano. Drums were recorded last, with headphones cranked way too loud. No expense was spared to bring you the ultimate in shiny pop. Some of this music is quite old, and some is newer.